WSU’s new head coach would develop a passing attack that had constant visitors from the pro leagues at his practices in order to pick his brain, and he earned a reputation as an offensive genius. 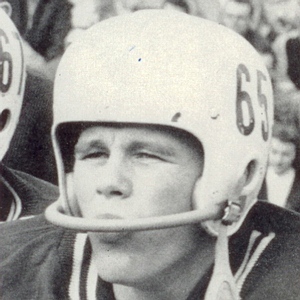 Former USC blocking back Jim Sutherland was christened with the nickname “Super Suds” by the time he left Santa Monica High School after nine successful seasons as head coach that resulted in a winning record nudging ninety percent. After an assistantship at Cal under Pappy Waldorf, Sutherland joined John Cherberg’s Washington staff without the benefit of the head man’s approval. Hired by the AD and boosters to enhance a weak attack, Cherberg always believed that “Suds” was after his job and after two seasons, the tension was felt by the entire program. Moving cross state to Pullman, Sutherland brought a new offense and a new uniform, replacing the crimson shells with solid white that were enhanced by three-inch thick rounded style crimson player identification numbers on each side. The new offense was a straight T-Formation attack that emphasized the pass. Sutherland’s QB combination of Bob Newman and Swinton “Bunny” Aldrich teamed with a group of receivers led by All American Bill Steiger and immediately set a new conference record of 2068 passing yards despite a poor 3-6-1 mark. 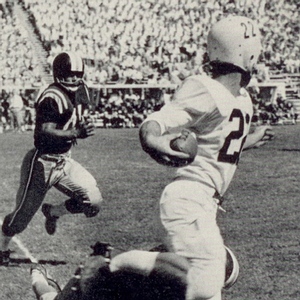 Steiger’s thirty-nine receptions was the second best mark in the NCAA and he was named a Look All American. Center Ted Gray anchored a line stocked with young players.